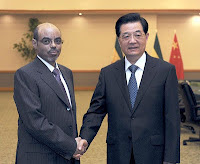 Ethiopia's government has denied Prime Minister Meles Zenawi is critically ill but says he has been in hospital. "He is not in a critical state. He is in good condition," spokesman Bereket Simon told the AFP news agency.A spokesperson for the Ethiopian embassy in London told the BBC the 57 year old was in a stable condition after hospital treatment. Speculation about his health began when he missed last weekend's African Union summit in Addis Ababa. There were reports that Mr Meles was in hospital in Belgium, suffering from a stomach complaint. The Ethiopian embassy spokesperson in London said the prime minister had been visited by high-level officials, but did not say where he was being treated. Diplomatic sources in Brussels told AFP that the Ethiopian leader was in a hospital in the Belgian capital. "He is in a critical state, his life is in danger," the agency was told by a diplomat who asked not to be named.